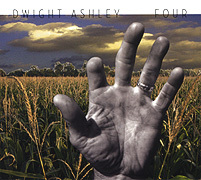 Four (54'46") is the 2nd solo album by electronic musician Dwight Ashley. Featuring 11 hymns to the worldly religion of the mind, Ashley's frostbound expressionism is both familiar and new. The album's vast surround conveys a restless immensity. Ashley's work on Four is intentionally unsettling, calling attention to itself and the dignity of its "otherness". It's icy (but not inhibited), frigid (as in penetrating) and somewhat self-conscious as at more than one juncture the listener is challenged, dared, to follow on. His work is smooth, concentrating more on texture, tone and atmosphere than with narrative. There are no overt rhythms to count or melodies to grasp. Four is experienced on a more cerebral level. This work may seem remote, but Ashley's presence is felt throughout. At certain points he can be noticed nudging the quiet music along, while elsewhere he is found trying to contain the torrential flow of converging harmonies and conflicting timbres. The world of form is infinite. Four is an endeavor into tone, elegance and the complexity of intentions. Ashley puts into sound a vastness that only the imagination can contain.